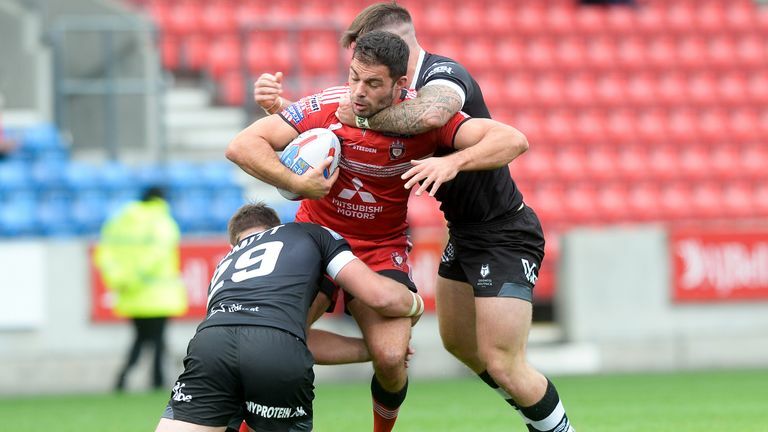 Salford edged closer to retaining their Super League status despite having two players sent off in a hard-fought 28-16 victory over Toronto Wolfpack at the AJ Bell Stadium. Luke Burgess and Jackson Hastings both received red cards in the second half but Toronto had given themselves too much to do after trailing 20-0 at half-time. Ian Watson's side have now won four from as many matches in the Super 8s Qualifiers as they look on target to retain their top-flight place. Full-time: Salford Red Devils 28-16 Toronto Wolfpack. The Red Devils make it four wins from four in The Qualifiers despite being reduced to twelve men. Ryan Lannon with the crucial try at the AJ Bell Stadium. Salford had looked in little trouble after scoring four first-half tries. Ed Chamberlain crossed in the sixth minute after being set up by Niall Evalds and Robert Lui, with the scorer adding the conversion. Salford's Lama Tasi was sin-binned for a high challenge on Gareth O'Brien in the 14th minute but Toronto were unable to make the most of the extra man. Lui barged over from dummy half after some good work by Hastings and Chamberlain. Another conversion from Chamberlain made it 12-0 and he kicked a penalty soon after when Toronto were penalised for lying on. Five minutes before the break, a 70-metre Salford attack was finished off superbly by Hastings as he raced under the posts and the goal made it 20-0. 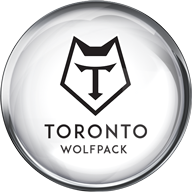 Three tries in quick succession at the start of the second half gave Toronto a fighting chance. Adam Sidlow and Matty Russell scored within three minutes of each other to cut the deficit to just 10 points. 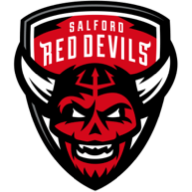 Salford were reduced to 12 men after Burgess was red carded for a high shot on Jake Emmitt and Toronto were quick to take advantage with a try from Andy Ackers which O'Brien converted. However, rather than push on with the extra man, Toronto themselves had a player sent to the bin - Chase Stanley yellow carded for a high tackle. Salford were able to complete the job with a try from Ryan Lannon with 18 minutes remaining which Chamberlain converted, before adding a penalty soon after. With time almost up, Hastings was sent off for a dangerous challenge on O'Brien.